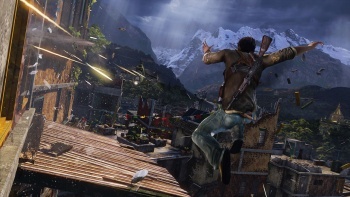 Uncharted 2's multiplayer mode was a nice touch, but Naughty Dog is not likely going to stop there. I'm not a big proponent of judging a game simply by its review score average, but its safe to say Uncharted 2 is probably a good game. This is no doubt partially due to Naughty Dog's inclusion of a multiplayer mode that is almost so good that it could stand alone, from my experience. Speaking to Game Informer, Naughty Dog's Evan Wells made his intention to include online features in all future Naughty Dog games known. As he says in the interview: "Uncharted 2's multiplayer is just a steppingstone, as I see every game we do in the future having some sort of online feature set." This is even in spite of Wells acknowledging that online features, such as multiplayer, are pretty challenging to implement properly. Wells says that Uncharted 2's multiplayer mode required testing from the entire Naughty Dog team (other than the staff's two actual dogs) "every day." This makes sense, considering how fun and balanced Uncharted 2's multiplayer feels. Also, while some of Naughty Dog's staff is on vacation, Wells says that his company also has "a bunch of people diving into our DLC and making improvements to the multiplayer that we want to roll out right around launch." Though it has been revealed that Uncharted 2 would be supported with future DLC, I'm still intrigued to see just what it might be, though multiplayer maps and modes are likely. Get your Indiana Jones hats and Lara Croft tank tops ready, Naughty Dog's Uncharted 2 launches on October 13.